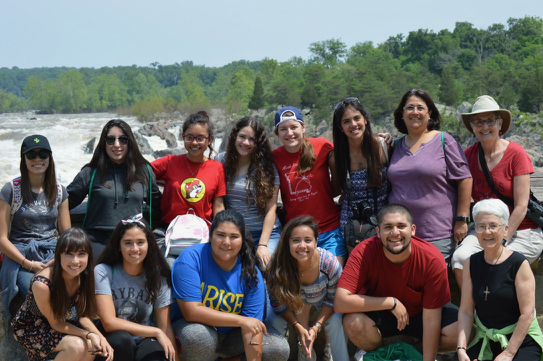 June 3–9, the Stuart Center in Washington, D.C., hosted the Sacred Heart Global Citizen Program, bringing together 12 participants from Mexico, Puerto Rico and the United States to participate in a week of exploration, conversation, reflection and prayer. This year’s focus was Ecological Transformation through Spirituality. The program was co-organized by the office of Educational Initiatives and Leadership and the office of Justice Peace and Integrity of Creation at the Stuart Center and in collaboration with the Center for Spirituality in Nature in Washington, D.C.
“I’ve run a lot of programs. Every group is different and this group was really special,” said Beth Norcross, the founder and executive director of the Center for Spirituality in Nature, who facilitated the week, leading discussions, spiritual excercises and field experience, each day, that focused on different aspects of our earth and our relationship to it. “I was impressed by their poise, depth and ability to be open to a wide range of spiritual experiences,” she said. Each morning, the group gathered at the Stuart Center to participate in a lesson paired with small group discussions, meditation and outdoor spiritual exercises. Each afternoon, the group visited local nature sites such the United States National Arboretum, the Anacostia River and Rock Creek Park, where they explored the local flora and fauna, heard from a local environmentalist, participated in group discussions on topics like water quality and delved into issues like eco-racism. Participants shared stories about their own communities and the issues they face or see. In particular, three college students from Puerto Rico shared personal accounts of the devastation from and the aftermath of Hurricane Maria that shook the island in September 2017. The most prominent issue they touched on was lack of clean water. “It was stressful because we had so much water and we are an island surrounded by water, but all of our water was tainted,” said Omar Rivera-Echevarría, a fifth year student at Universidad del Sagrado Corazón from Arecibo, Puerto Rico. “After the hurricane, no roads were accessible to buy water. You could go to the store, but none were open. If you didn’t store water before, you were basically dead. So neighbors shared water … and the hurricane reminded us that we have a neighbor,” he added. “Some of these young people had come from difficult circumstances and yet the joy they had for each other and, notwithstanding, that they had suffered abuse from nature and the environment, they were still so very open to the possibility of God’s presence. It just knocked me out,” said Norcross. At the end of the week, the Global Citizen participants had the opportunity to hear from Eva Marie Carney, a Citizen Potawatomi, who shared the Potawatomi creation story and about their connection with creation. Many in the group expressed their gratitude for the experience and the week as a whole - the opportunity to meet and learn about each other’s homes and the realities present across our continent. On the last day of the program, each participant made a commitment both spiritually and practically to take back home with them. “This week I saw a chance and an obligation to do something about creating awareness about water equality and reminding others that just because you have an abundance, you shouldn’t waste or take it for granted,” said Yannina Samilpa, a student at Colegio Sagrado Corazón in San Luis Potosí, Mexico. At the conclusion of this year’s program, the Global Citizens, all affiliated with Sacred Heart sponsored ministries, joined RSCJs, Associates, Sacred Heart alums, educators, friends and family at the Stuart Center to celebrate the Feast of the Sacred Heart. This year marks the fifth year and the first consecutive year for the Global Citizen Program. The program typically runs every other year. It is the successor of the Sacred Heart International Service program, which ran about 10 years and, over that time, served 180 young adults from 13 different countries, said Sister De Stefanis. **This article was originally published on the USC website: click here. **An article in Spanish was likewise posted by a participant: click here.